Nanny’s Pavillon, a pancake restaurant with French American concept launches its Christmas menu on November 19th, 2015. This menu will be available at its 18 restaurants from 20 November 2015 to 3 January 2016. With “Fashion Navidad” theme which means “Christmas Fashion”, Nanny’s Pavillon combines fashion and food in its menu for the Christmas Celebration. GM Marketing Nanny’s Pavillon Kevin Cheung said that Nanny’s Pavillon’s Christmas menu is more instagrammable and prettier than before. “Fashion is not only about how you dress up. This term can be used in food, art, and architecture. Fashionable food means that this food has its own appeal. It is beautiful to look and makes people want to perpetuate it in the form of photographs,” said Kevin Cheung. The first Christmas menu of Nanny’s Pavillon is Creamy Mushroom Soup. It is a creamy and fresh cooked mushroom served with garlic bread. This menu is priced at Rp39,000. “Creamy Mushroom Soup is also the first Nanny’s Pavillon soup menu ever,” said Product Development Manager Nanny’s Pavillon Ericko Darmawan. The second Christmas menu of Nanny’s Pavillon is Santa Pancake. It is a happy Santa’s face topped with blueberry sauce, chocolate sauce, fresh strawberries, sliced banana, and marshmallow. This menu is priced at Rp42,000. “This menu is inspired from Nanny’s Pavillon Cooking Class. Most of the participants are kids and they love to make face on top of the pancake. Santa Pancake is meant as a Christmas menu for kids,” said Ericko. 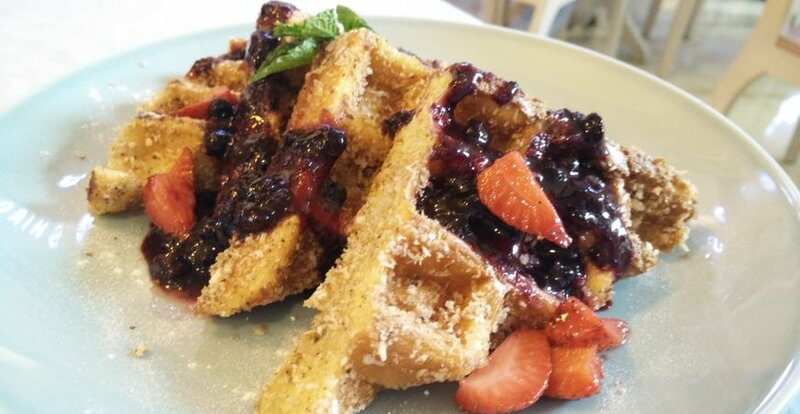 The third menu is Mix Berries Crunchy Waffle. It consists of a crisp and brown French toast waffles topped with mix berries compote and maple syrup. The fourth menu is Choco Banana Crunchy waffle. It consists of crunchy waffles topped with caramelized banana,ice cream, crumbled almond, and drizzled with homemade choco sauce. Both of the waffle menus are priced at Rp49,000. The fifth and the last menu is Red Velvet Milkshake. It is a thick and creamy cake-in-a-cup with smooth cream cheese and rich chocolate flavour. This menu is priced at Rp35,000. “The red colour of this beverage symbolizes our Christmas celebration,” said Ericko. Besides the food, Nanny’s Pavillon will provide “magazine cover” photo booth for the customers as well as organize Christmas pancake cooking class, Instagram competition, beauty workshop, and mix n’ match workshop with food and fashion blogger as speakers.